I'm taking a break from holiday themed designs with this birthday card based on the current My Favorite Things Wednesday Sketch Challenge. I reapresented the layout's long, wide rectangle with a bunch of candles, stamped with the Make a Wish stamp set and cut out with the coordinating dies. 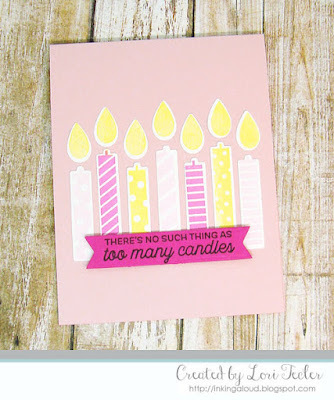 I arranged the die cut candles on a pale pink card base, then added yellow flames above them. 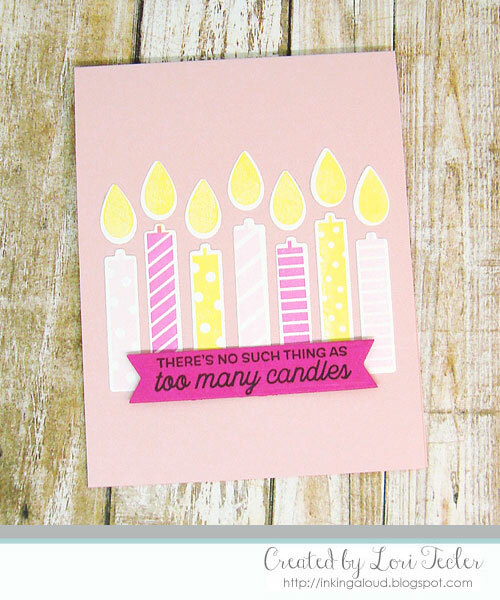 For the sentiment, I stamped the "there's no such thing as too many candles" on a bright pink fishtail flag strip in black ink. The sentiment was adhered over the bottom of the candles using foam tape.